This corner parcel of land near East Broadway and Carolina Street, where several heritage properties sit, has been put up for sale. Sarah Lindsay's 1903 character house near the corner of East Broadway and Carolina is like a little hideaway, tucked between old commercial buildings, and surrounded by condos in various stage of development. It is one of the last remaining heritage houses on busy East Broadway, and the corner parcel on which it sits, which includes two other buildings – a sushi restaurant and bottle depot – is now for sale. In Vancouver, that means certain gentrification for a clutch of old buildings. Construction and concrete trucks have become the norm these days, along this inner city strip. It's the end of a community, says Ms. Lindsay, who laments the loss of many long-time stores that have already moved away, such as East Vanity Parlour and John's Jukes (a juke box store). The Foundation vegetarian restaurant closed its doors after 15 years because of rising costs. Sarah Lindsay, who has lived in a 1903 heritage home for 15 years, is making plans to move to Montreal because her landlord is selling the property. Ms. Lindsay, an antiques collector, shares the two-level home with a revolving door of artists and others who've been recently evicted by landlords seeking higher rents. In her case, her landlord can't afford soaring property taxes. "My landlord says the saddest thing is they feel like they're losing part of their family because I've been here so long." Inside the house, every wall and shelf is filled with old taxidermy, medical equipment, religious adornments, books and documents, and other gloomy artifacts. She has rented the Heritage B-listed house for 15 years. Her landlord has kept her rent low. Also on the large corner lot is a retail building from 1926 that contains a restaurant with two large rental apartments above it. She knows the tenants, and they rent for around $800 a month. Around the corner from that, on Carolina, is a bottle depot in a heritage warehouse. A lot of homeless people, she says, depend on it for income. Although she hasn't received notice, she's making plans. She will go to Montreal next month to scout around for a home. "I'm watching everyone I care about move. That's why I'm done here," she says. "They move to Montreal, Alberta. New York, Seattle, Portland. We are losing the artists' community – that's the biggest thing – the eccentrics; the people who create and build. And the thing that upsets me is [the value] of these properties. That's what is causing landlords to push the rents up, to kick people out. That is the seed. But where is all that money going to? Is it going back into the city? "I have so many friends struggling. They make over $20 an hour and they still live paycheque to paycheque. We're all struggling, in our mid 30s, hitting 40, and we can't buy homes." Up and down this section of East Broadway in Mount Pleasant there are condo developments underway. Directly across the street, Port Living has completed a sold-out four-storey condo project with retail on the ground floor. The same developer has another project a block over under construction, called Midtown Modern. Even luxury housing has arrived to a neighbourhood that has always been an enclave of affordable rental housing. 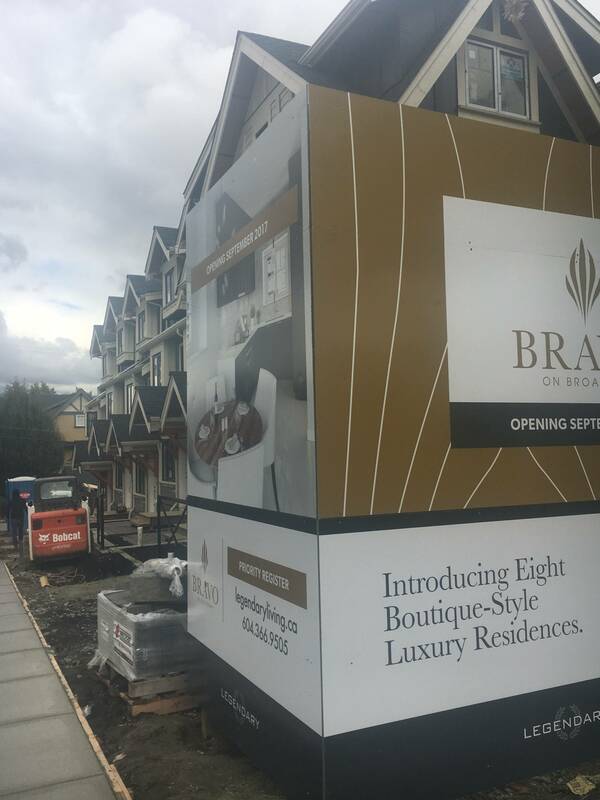 East of Fraser, the Bravo on Broadway project, consisting of eight boutique style "luxury" townhouses, is nearing completion. Sales start this week for the three-bedroom units with enclosed garages, ranging from $1.2-million to $1.525-million. The development frenzy is the result of the city's plan to increase housing choices with more duplexes, townhouses, apartment buildings and higher density zoning for single-family houses. The belief was that with more supply, housing costs would have to go down. Instead of affordable rents, the area is gentrifying faster than you can say caffe macchiato. Signs are popping up everywhere in front of rows of houses on arterial roads, for sale as potential land assemblies. Realtors are marketing buildings in anticipation of a future SkyTrain extension along Great Northern Way to Broadway. 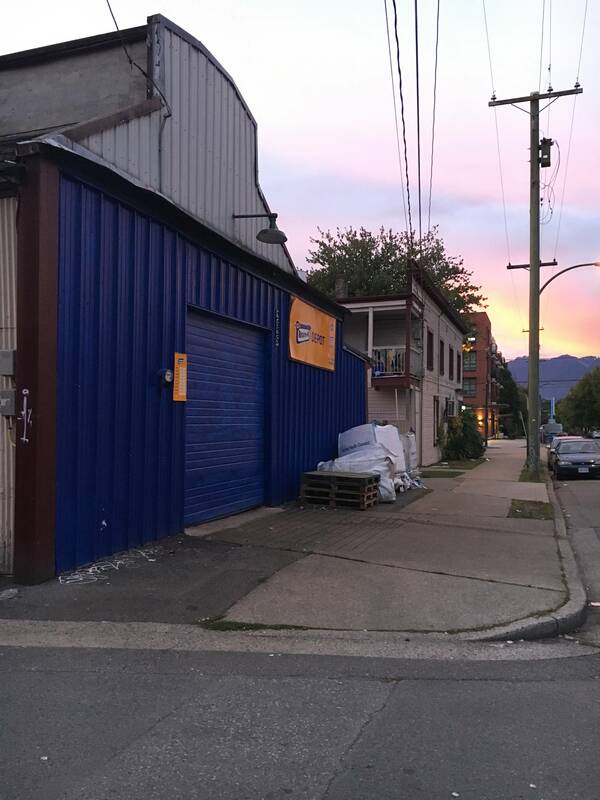 The area is becoming the next Cambie Corridor – the city's latest draw for speculation and profit. A few years ago, the city put together a citizens' assembly that spent six months working on a plan for Grandview Woodland. Although there are an estimated 25,000 empty housing units in the city, the group was encouraged to find ways to add significantly more density. Writer and community activist Garth Mullins, a former member of the Grandview-Woodland Area Council who participated in numerous meetings with the city and community, considers the consultation with residents a wasted effort. "We're in a worse place than three years ago, when the plan started," says Mr. Mullins, referring to rents and property prices, and displacements. He's seeing houses that were once filled with tenants now redeveloped and housing fewer people. "Back in the day, that's how we all used to live around here – there was no such thing as a single-family house that housed a single family here," says Mr. Mullins. "They were made into rooming houses or smaller suites." He says a big house that once housed 10 people is now a pricey duplex that houses two couples. "System-wide, it's had the effect of social cleansing. So many people I've known and grown up with have had to move from here. It's dramatic. "You may increase the total number of units in the neighbourhood, but it's not like you're making room for more people. You're just moving out the old people and bringing in the richer people. "This 'supply is the answer to everything' argument is an Economics 101 fail paper right there. It's just fuelling the crazy cycle. "This was one of the big fights inside that Grandview area plan, was 'just leave the existing [homes] alone,' and they were like, 'what if we change the zoning a little bit and have more units, won't that be great?' But no, they won't be the same rents. It will be like eviction from the city." Gil Kelley, who's been the city's chief of planning for the last year, sympathizes with people like Ms. Lindsay and Mr. Mullins. "I think it's fair to say much of the city is reeling from the pace of development," says Mr. Kelley. The city has long argued for more supply as a remedy to the crisis. As everyone can plainly see, that hasn't worked, says Patrick Condon, chair of the Urban Design program at the University of B.C. "If we only had people in our local region who were influencing the purchase price of housing, that would be fine – the laws of supply and demand would pertain. But it is increasingly obvious that what's affecting our market is global flows of wealth." Recognizing a problem, the City announced this year that it would set housing targets based on incomes, not merely the number of units built. Luxury units in particular haven't been useful to the average resident. "We have been producing a lot of housing, but most of that housing has been of a supply that meets investor preferences. It's really the high end of the market," says Mr. Kelley. A section of the new Vancouver Housing Strategy, which goes before council in November, will look at speculative buying. "The prices are crazy because the outcomes are not really known, but the ambitions are high, so people are willing to pay lots of money and hoping to make it up in the rezoning process," says Mr. Kelley. "Until we put parameters on the rezoning policy, that will continue to happen. We want to be explicit. "We aren't going to build our way out of it. We need to limit land speculation, and do substantial housing production, but have it targetted toward incomes." For example, the city is working on zoning that has a percentage of affordable housing built into it. That sort of zoning makes the rules for everybody clear at the outset, and should also dampen speculation because it instantly lowers the profit margins, he says. Many who've studied the problem argue that the city's lack of an official citywide plan is the culprit behind speculation. Vancouver is the only municipality in Metro Vancouver without a detailed overall plan, which sets out what is allowable and what isn't, says Prof. Condon. Without a plan, developers decide what the city should look like, not the residents. It means spot zonings in areas outside the downtown core that throw neighbourhoods out of whack. And it means speculation that drives up prices and turns housing into holding properties. "It's my feeling that unless we cover the whole city with a transparent plan for what is allowed and not allowed, giving out individual spot zoned locations one at a time is going to continue the speculative nature of our developable lands forever," says Prof. Condon. Mr. Kelley agrees that Vancouver needs to start talking about its future in a big-picture way. He was head of planning departments in San Francisco, Berkeley and Portland, and those cities, he says, had comprehensive citywide plans. As a planner, he's most familiar with working under that system. "We need to start knitting together the citywide picture of where do we want growth to go over coming decades, and in what ways would we like that growth to be shaped? "There hasn't been a conversation about that, and that's something I would very much like to promote. Given the work in front of us, including big planning efforts, and the housing strategy, I think it's a discussion that begins next year, or maybe gets off the ground after the election. "With better planning and policy work, we can prevent or at least dampen the pretty powerful force at work in the real estate market here, which we may not be able to totally overcome," says Mr. Kelley. "That said, I believe optimistically in the power of good planning." Mr. Mullins believes more in the power of civil disobedience. He can't see any plan working if we keep relying on the market for answers. "The solutions by the city are so out of proportion with the level of crisis," he says. "We need to say, 'no more rent increases, no more luxury builds, no more developments,' and we have to get out of these endless bad faith consultations with the City, and into the streets, and maybe stand in front of these places and prevent these evictions." Editor's Note: The print and original online version of this story incorrectly stated that Mr. Garth Mullins was a member of the citizens' assembly working on a plan for Grandview Woodland. He is not. This online version has been corrected.